Thank you for visiting and considering me in your quest for touch. I have been in practice for 33 years to date and would consider it an honor to meet you. I offer Swedish Massage, Shiatsu Massage, acupressure and various energy work to accommodate your needs and or desires should they encompass a "healing need" or simply a quest for relaxation or escape. Having had the privilege of spending the past 33 years as a Licensed Massage Therapist in Ulster County, New York I have concluded that, post graduate, some of the best studying I have done has been during my 35,000+ client hours. My table, my Shiatsu mat and my clients have been and continue to be my best teachers along with my mentors in the field encompassing science, body, mind and spirit. In my work intention leads and my hands follow. Having studied at the Swedish Institute in NYC where my substantial foundation included anatomy and physiology, I was prodded to study Applied Kineseology, Polarity and other energy modalities and eastern philosophies and to incorporate the martial art of T'ai Chi (of which I was already a student) into my work mechanics. Furthering my studies I later did post graduate work through the British Institute of Homeopathy and continue to further my education through the CEU requirements in NYS as well my more than three decade path of T'ai Chi Chuan. Come visit, enjoy the music offered inclusive of jazz, folk, classical, blues or classic and modern rock culled from a collection of over 20,000 albums that add to what I hope will be an experience beyond our expectations. Rehabilitative massage and reclamation are my passion. No fault clients are accepted with prior approval, doctor's Rx and client commitment. 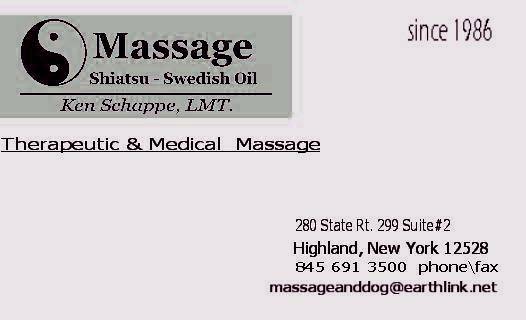 © Copyright 2019 ken schappe massage (massage and dog). All rights reserved.